Sometimes a toasted fruit teacake and a steaming mug of hot chocolate are the only things that can put the world to rights. 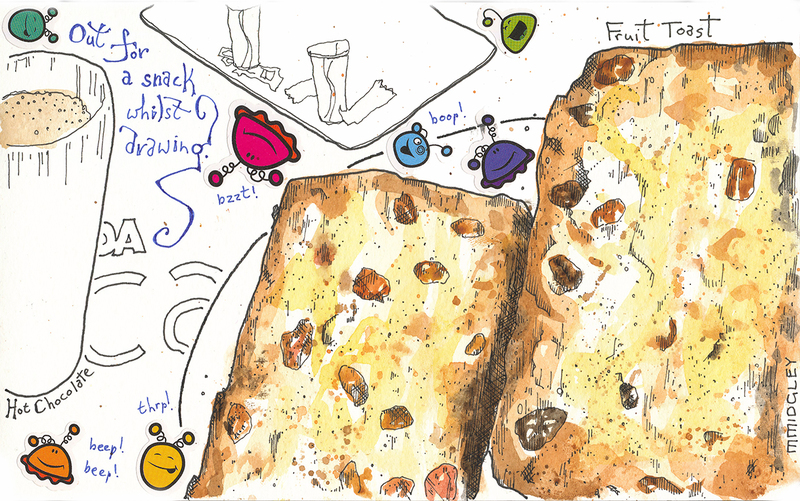 There’s jus something so comforting as a toasted fruit teacake. I’ve been revisiting some older illustrations today and while this isn’t from way back in the mists of time, it is one of my earlier meal illustrations. Out on a bit of driving tour of Tenerife, we stopped off at La Laguna and found this fabulous little coffee shop. My Bizcocho Zanahoria was a bit like a plain scone, dusted with icing sugar and light as a feather. As we sat and watched life pass the shop Morcheeba was playing on the CD player and I sighed at the thought of finding a similarly cool hang-out back home. I know of several artists who have found ‘their’ cafe, their spiritual (and caffeine) hang-out. But, for all my meals and snacks out I haven’t yet found mine. Just the thought of it conjures up images of snuggled up in dressing gowns clutching the hot mug between your hands and sipping carefully at the steaming chocolate. Quite often we reach for the instant packet of hot chocolate; great for speed and convenience, but not so great on the sugar. Commercially bought Hot Chocolate is always way too seer for my liking. Why not make your own hot chocolate? The only ingredient which isn’t probably already in your store cupboard is the vanilla pod. Okay, so we’ve got a vanilla pod. Here goes a smooth and creamy Hot Chocolate recipe that hits all the right notes. Heat the vanilla pod, seeds and milk in a saucepan until boiling. Whisk until frothy on top and add sugar, to taste. Serve with a dusting of nutmeg. – Add a cinnamon stick in at step one to give it a little extra twist. There’s a certain amount of delight that can be had from miniature things. I used to feast on puddings whenever we dined out. I think it stemmed from puddings being a particular treat when I was younger. They seemed to be a scarce commodity at home and we certainly didn’t dine out as much. This is as much from a change of culture in western society rather than purely economic changes at home. Once I was earning my own money, and making my own culinary choices, puddings seemed to rise up in their importance. I remember a distinct phase, attending college, where puddings ended every meal. I enjoyed baking my own cakes. And sharing them, I hasten to add. Now, not so much. That brief spat of sweet toothedness seems to have given way to a greater appreciation of the savoury. So, today’s choice was a little unusual, in that I don’t normally choose to have a cake. But, as I wrote on my sketch – it was a mini cake … and so darned cute! Barely a couple of mouthfuls really. If you have enjoyed this post, or my drawing, please feel free to share on the social media of your choice.